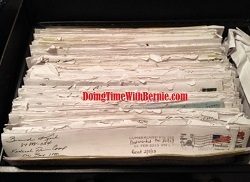 DoingTimeWithBernie.com: Of course the Secret Service and NYPD share Pope Francis security secrets with corrupt cop convicted felon Bernard Kerik! Of course the Secret Service and NYPD share Pope Francis security secrets with corrupt cop convicted felon Bernard Kerik! Of course the Secret Service and NYPD share their Pope Francis security detail secrets with corrupt cop convicted felon Bernard Kerik! Today we were once again enlightened with corrupt cop convicted felon, Bernard Kerik, masquerading as NYPD Commissioner Bill Bratton stammering, and obviously fantasizing about the Secret Service's plan to Protect Pope Francis on his brief tour through New York City. Listen to this crap here. Now what idiot still considers criminal Bernard Kerik an "ex-spurt" on these matters? That idiot is John Gambling of the fledgling 970AM radio "The Answer". Of course Bernie's entire knowledge of the Pope's secret security detail was based upon a short walk he and his daughter took by St Patrick's Cathedral. Bernard Kerik knows nothing the NYPD or Commissioner Bill Bratton are planning for Pope Francis' security detail. Bernard Kerik is an eight-time convicted felon who squandered that privilege for life trading it for home renovations, a few romps in the sack with subordinates:Judith Regan and cheating on his taxes! 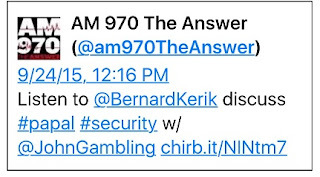 We also were subjected to convict Kerik's jealous diatribe regarding the state of Rikers - "From what I hear from the staff at Rikers..., Bernie quips...Like, he's in charge again? Delusional!!! What NYC DOC personnel is divulging confidential information to a convicted felon presently serving probation? That officer should be fired and convict Kerik should be violated in his probation! "Staff that's gotten outta hand and done things they 'shouldnta' done"..Oh Bernie, you mean like having an affair with subordinate officer like maybe Jeannette Pinero? Really Bernie? 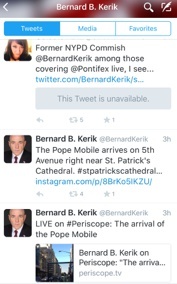 Celeste Katz, formerly of New York Daily News, was all a-twitter about seeing Bernie Kerik gazing upon Pope Francis. I'm happy our good Pope survived being so close to the devil. As for the Holy Father's visit, I should pray Pope Francis' presence will impress upon convicted felon Bernard Kerik to stop lying, cheating, manipulating, masquerading as a legitimate police officer and finally repent making full amends to those of us he has hurt. At least it was an impressive Daddy-Daughter day. Perhaps his daughters' souls can be saved despite his horrible model as parent in their young lives. John Gambling and 970AM should be ashamed to promote a disgraced felon on their airwaves passing him off as an expert! Another fraudulent event in the shameful life of a scheming, unrepentant felon Bernard Kerik! That, Mr. Gambling, is "The Answer".